This afternoon we went for a walk around central Palermo. In Piazza Politeama we saw these fellows. 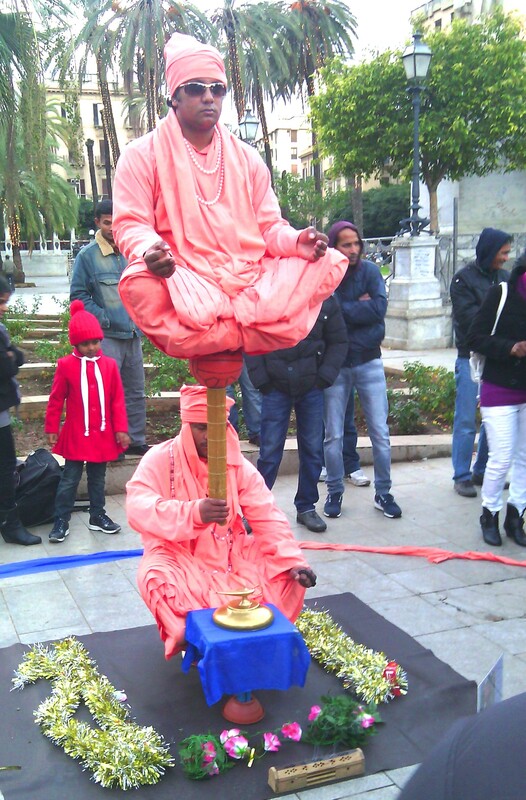 The man at the bottom was sitting cross-legged on a glass tumbler. All along Via Ruggiero Settimo there were buskers playing drums and guitars, there were fire-breathers and jugglers, there were men on stilts making balloon animals for the children, and there were girls dressed as witches performing magic tricks and giving sweets to the children. Today is the Epiphany, when the Magi arrived to give gifts to baby Jesus. For Italians, this festival is called La Befana. The Befana is a friendly old witch who brings gifts to the children: a stocking containing sweets, if they have been good, or a knob of coal, if they have been bad. Hence the witches on the prowl! Lots of the performers were Asian and some were black. It is a very recent thing to see non-white foreigners in Palermo integrated into mainstream society in this way, and a very good thing. The isolated Sicilians desperately needed a bit of the outside world to reach their shores. The thing I don’t like is that you see lots of these Asian men out and about, often with their children, but where are all the women? It seems they are never allowed out of the house. The Sicilians were this boring a few generations ago. Honestly, it’s as boring for the men as it is for the women. Hey, Asians, you can have whole family fun now you are in Italy! The only multicultural element in my son’s class is, actually, my son. I have a few ridiculous scenarios in my imagination. One is where I move to Amsterdam and take a job as a sales assistant in one of their marijuana shops. I strongly disapprove of marijuana use, so I refuse to sell any products to any customers, yet I admire and respect their outstanding human rights laws so I continue to get paid my salary, while doing nothing. In another of my silly scenarios I have moved to Saudi Arabia. I find the sight of women wearing hijabs offensive so they all have to remove them while they are talking to me. Women are not legally allowed to drive in Saudi Arabia, but of course I am, because otherwise I’ll get offended. Women and men have to eat in separate areas of restaurants in Saudi Arabia, including in McDonalds, Starbucks and Pizza Hut, but of course, the Saudis would not want to offend me, so they allow me to eat my Big Mac with pork meat in among the men. In another silly scenario, I have moved to Catholic Sicily and I feel offended that my son is glueing glitter on a plastic baby Jesus at Christmas time. So the entire class of Catholics has to pretend to be atheists, for my sake. Well, nothing to add. – Ah, let me add a Web link to an interview with German author Seyran Ates about the “Multicultural Mistake” (she is Turkish-born, today proud to be German). She provides the intellectual approach to a good solution: “Transculturalism” instead of “Multiculturalism”. Multiculturalism means: You move to another country and stay what you have been before. Period. Transculturalism means: You move to another country, and you learn to live in the new culture, as well as you keep your previous culture, like learning a new language without loosing your mother tongue. If new and old collide: Then the country you live in has priority. Sounds easy, isn’t it? That’s a very fascinating article, thank’s for that link. “On the one hand, permissive and suggestive advertising is accepted, but at the same time female pupils are allowed to be absent from sports lessons for religious reasons. It just highlights so clearly how it is impossible to have two different cultures in one single place, and gestures towards pretending that you can are meaningless. If you wanted to pander to a foreign culture within your own, you would have to go all the way and change your whole culture, which would benefit nobody. I love the guys sunglasses, they are so cool. Did you work out how they did it? Please don’t let Sicily go the same way as the UK. Go and shout at the headmistress. The whole set up looked so cool! Nobody was really sure how they did it, but I think they must have had metal supports inside their sleeves and inside the whole thing. Though there was nothing inside the glass supporting that, though. However they did it, they were very clever! The whole school has developed a policy of ignoring the headmistress and doing what we want to, without bothering to talk to her. Sadly she is too stupid to reason with. Being part-Sicilian, it pains me to see how Italians are so superstitious and never question the Church. Jesus wasn’t even a baby any more by the time the astrologers brought him gifts. Now what I wanna know was, did he ask you to go out for an Ice’a Cream’a? I think the way Sicilians are devoted unquestioningly to their religion is a result of the fact that they have no exposure to foreign cultures or religions and know nothing about them. They don’t even realise Protestants are Christians, for example. I see it as just one part of their insularity… which often makes it very difficult being a foreigner here. Oh, boy, I enjoyed this. In France we are now getting similar situations – the visit of Father Christmas was banned by some school teachers becaaseot could “offend” other religions. Where on earth are we going with all this? When in Rome, do as the Romans do… Nothing stops me speaking English, watching Peter Kay DVDs and eating fish & chips at home – if I could only find a damned chip shop. No, wait a minute, I’m going to follow your advice and find myself a European Law that will impose a chip shop on the locals for me because I am “multicultural”. Maybe I’ll even find a few do-gooders to help m, and thus encourage the French to hate forieigners on the grounds that they get away with murder on occasions. But would chips be the same doused in wine vinegar and wrapped in pages of le Figaro? Meuh. I think we both know Le Figaro would ruin the taste of your chips. They would be far more delicious eaten out of a double-page feature about Nigel Farage in the Daily Mail. By the way, I have taken to carrying PG Tips teabags around in my handbag, and in cafes I order a pot of hot water, then put my own teabag in it, informing the staff that their sachets of gerbil dung are offensive to my English tastebuds. Shall we bring a class action lawsuit before the European Court of Human Rights demanding that they stock proper teabags everywhere? It would be very culturally insensitive of them not to, wouldn’t it? Oh, tea bags. I’ve given up on tea and embraced the expresso – me and George Cloooney are the perfect team. In French cafés they bring you a cup of tepid water and something I initially took for a tampon but is actually an oblong tea bag with a string attached to it, so that you can remove it without buring your fingers. I’ve noticed that some women use it as an attention seeking thing – they play with the teabag and dip it in the water as they chat. Maybe you’re just not supposed to actually drink the stuff (definitely not tea, even if it always has a reassuringly “more British than a bulldog” name on the label). PS I won’t touch anything that’s been in contact with the Daily Wail, I might catch some awful disease like intolerance, or even wake up the monring after with the inability to use words of more than two syllables. Oh, you think those wretched things look like tampons too? The worst thing is the way the slurry that comes swirling out of them is not a dark rich brown, but a vaguely reddish… oh dear, I had better stop this. If ever I find my handbag lacks proper teabag supplies, I demand FOUR Italian “tea-pons”, telling them this will be only just adequate for a decent cuppa, and I ostentatiously pull those strings off before letting them get anywhere near my teapot. I also regularly send teapots back and demand hotter water: I am not drinking something colder than bath water. One must maintain standards. But I don’t agree about the Daily Mail. It is so ridiculous I read it regularly. It’s the best way to make sure my sense of humour is always intact. Nothing like a few fundamental secularists to try to kill Christmas. Who needs scrooge or the grinch? The Major of Sydney tried to ban tinsel & other Christmas decorations about 10 years ago… Although I did not support that, I do prefer the more inclusive ‘seasons greetings’. Even maccas has had to negotiate the fine line between cultural resistance, assimilation and annihilation when it enters new markets. The Grinch! You are so right! I like the Pulp Fiction McD scene – and I LOVE chips with mayonnaise! Yum! Cool Trick. 100% agree with your cultural comment. My Italian (from Rome) friend is an auxiliary cop in East Harlem,NY. He was raised post WW2 Rome and is socialist leaning. He felt he would save the hispanic population in Harlem. He now admits that no one in these communities wants to change. They just transport their bad situation 2000 miles somewhere else. I agreed with him that society begins to break down once common language and common cultural values (in public) are not shared…such as school, work, communal spaces. America is a disaster in some public schools because the AMERICAN born children of immigrants don’t speak english well enough in elementary school and so translators are brought in to teach in multiple “native tongues.” My Sicilian grandparents would be ashamed that America has fallen so far. The school I refer to is in hip Brooklyn, NY btw. If I say the sky is blue, am I a racist because I call the sky blue? That’s where America is at now. Barf. Teaching children, who live in an English speaking country, in a language other than English is just setting them up to be disadvantaged for life. How very unfair to them. Have you read the link posted by T Franke? It’s very interesting – a discussion about multiculturalism (pretending you can maintain a culture within a culture) versus transculturalism (adapting to fit the prevailing culture). Hi, such an interesting post! Am mexican but I grew up between Mèxico and Texas, as if that wasn’t hard enough I went and moved to Sicily, I do believe sicilians will gain by opening themselves to other cultures but sadly (at least in my experience) they view other cultures as “less than” I can’t count the times I heard “Why travel if the best food is italian? 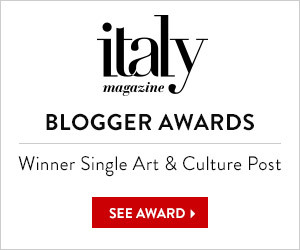 or worse ” We are going to travel outside Italy, we better pack spaghetti and sauce” alla Totò! 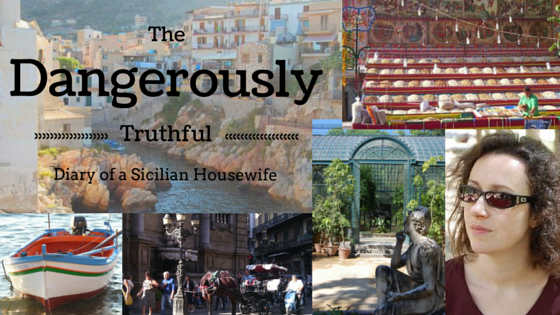 I too have gained a new insight to the sicilian way of living and I feel it has enriched my life. Some Italians are so silly when travelling. I have heard Italians saying they ate awful spaghetti in England and, based on this, concluding that “English food is horrible”. Seriously, true story!!! Mind you I have also overheard Americans in London saying “English food is awful” because they ate a Bic Mac in London that they did not find up to standard. At least you have found some Sicilians willing to travel, though. Most of the ones I know have never been abroad and have no intention of going! The silliest of all was a nurse I found crying her eyes out on night duty when I was in hospital. She told me her daughter was going to study abroad for 4 months and she was terrified, certain, that her daughter would be so changed and corrupted by the totally different culture that she would never be the same again. I wanted to be nice to this woman but I could not stop myself from laughing. I’ll give you one better, I have been told: “so you are from Mèxico, so you speak mexican! and you grew up in America? you speak american” trying to convince them that I speak spanish and english is an exercise in futility, although I can’t complain too much since my in-laws have welcomed me with open arms and they I even celebrate my traditions (like Thanksgiving day, 5 de mayo, etc) btw that nurse was hillarious! Spain is so similar to Italy that they are practically cousins! I wish I had one Euro for every Sicilian I’ve met who thinks American and British English are practically two different languages. He does know I am only pretending they are two different languages for a laugh, though! I had some laughs reading the comments, having had some familiar experiences. But I’m also saddened to read that dhimmitude has also entered the Italian education system (and probably other parts of society). It’s sad because it erodes the original culture away of the host country/society, which in the case of Sicily happens to be a very rich and longstanding culture. It’s also sad because it’s effect is irreversible. Decisions to cave in to requests (usually demands) of foreign subcultures who are intolerant of and refuse to adapt to their new society, are irreversible. Unfortunately, by the time people start noticing the damage that has done to their society, then it’s far too late, as in now the case in most north-west European countries. In the end the net result of having tolerance for the intolerant, is a culturally dull society with high social tensions. P.S. so what is the British English exact equivalent of sidewalk, as a sidewalk is a pedestrian path alongside a road, whereas that isn’t necessarily the case with ‘footpath’ or ‘pavement’? Oh no, my dear, that is exactly what a pavement is – a pedestrian path alongside a road. And I do agree with your comments, except I am not compeltely convinced that bending over backwards to humour foreign sub-cultures is irreversible. It’s the way reversal comes about that is worrying – political extremism often associated with racism and other unpleasant things that no society benefits from.